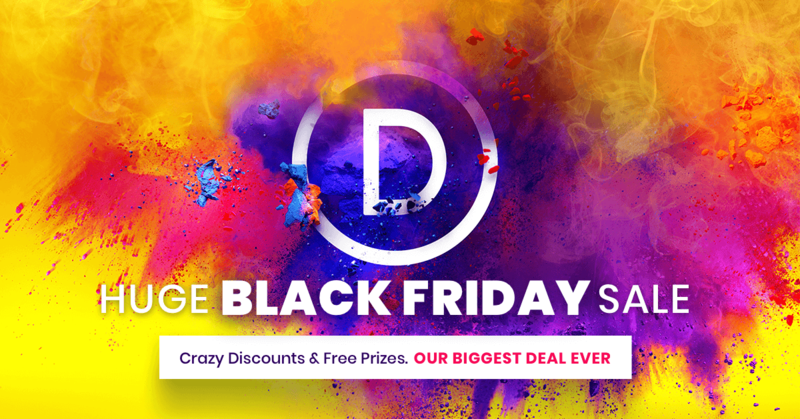 The Divi Black Friday Sale Starts Now! This is something special. This is the one time each year that we offer our biggest discount of all time. But that’s just the beginning, because we are also giving away $500,000 in free prizes ! Everyone who takes advantage of our Black Friday Sale today will walk away with a free gift, some worth hundreds of dollars. But that’s not all…we are also giving away exclusive Divi Layout Packs built just for this occasion and only available to Black Friday customers and our current Lifetime members. Get The Deal Before It’s Gone! Black Friday only comes once a year, and when it does, we like to do something really special. Today we are offering 25% OFF EVERYTHING, the biggest discount we have ever given. This discount has only ever been offered once before (during last year’s Black Friday and Cyber Monday sales), and once these sales have ended it won’t be back again until next year. It will only be available for a short time, and if you miss your chance this time you will have to wait a whole year before it comes back (so act fast)! Not only are we offering our biggest discount of all time, we are also giving away tons of free prizes to everyone who purchases a new account and to everyone who upgrades their account today! The following prizes are available for new customers, but they won’t last long. Last year some of the best prizes sold out in minutes, so be sure to visit the deal page and claim your prize before it’s too late! If you are a current members, today is the best day of the year to upgrade to Lifetime. Not only do you get our biggest discount of all time, you also get one of many amazing free prizes! The prizes won’t last long, so be sure to upgrade now to claim one for yourself! Everyone who takes advantage of our Black Friday sale will also get exclusive access to 5 Black Friday Divi Layouts. These are world-class designs built by our very own Divi design team. These landing page designs have been built in the spirit of Black Friday to help you increase conversions on your sales pages! There are a lot of great ways to put them to use. Our current Lifetime members haven’t been left out of the fun. You also get access to our exclusive Divi Black Friday Layouts. Even if you didn’t sign up during Black Friday, you can still download these layouts. We also encourage you to check out all of the generous companies that donated prizes for our Black Friday giveaway, because these Divi-related companies are running Black Friday sales of their own that you should really take advantage of! How do I get these Black Friday Divi-Layouts if I’m already a lifetime member? Too amazing for words, Divi is value on any normal day, the Black Friday deal just lifts that value up more than a few notches, 2019 is going to be an exceptional year. Anyone else unable to upgrade? I click on Upgrade, but nothing happens? I had this issue earlier today. I had to hit the upgrade a few times to get the credit card information to show up. We have an annual account with you. Is there any chance of access to the Black Friday UI layout other than purchasing again? I believe it’s for lifetime members. I am a lifetime customer, how do I get the Black Fridays Divi Layouts? Am I missing something – but where do I, as a Lifetime Member, download the 6 new Divi Black Friday Layouts – can’t find the download-links. I know it’s always a bit bold asking about free stuff, but just wondering how I can download the Black Friday layouts. I am already a lifetime member. I’m new to Divi and I was processing the payment of USD 187 for the lifetime access on the black Friday, then Eleghant themes site was ideal and USD 187 has been debited from my bank account. I got a mail with the receipt from Elegant themes when I tried to login it takes me to the renew page. I’m clueless why all this happening and now I’m losing all the free packages also as time is running out. Really disappointing Kindly fix the issue that happened to me as soon as possible. Sorry this is happening. Please use our live chat support so we can help you. When can i as a lifetime user download the divi Black Friday themes ? Amazing layouts! So precious! Thanks a lot! Where can we (lifetime members) download the layouts? I logged in and couldn’t find any layout for download. Oh, I’ve just realized that there is a link already! I think what people are finding hard to do is finding the Black Friday download section in the Member’s Area when accessing directly without using the link included in the post. If i buy a lifetime license i can download all the themes you give as a gift during black friday? But I have one question: why website are, most of the time, not developped for 4k display? Hi, i have just upgraded my account and i was in the count of 801-1000. How can i get that Divi BodyCommerce plugin. Please help me to get this done. How about the prizes? Do lifetime members have access to them? No. Only the Black Friday layouts. The blog post explains that for current lifetime members at the end. Hi, I buy Lifetime Membership! How can I download Pixie Bundle UI Kit, Divi den Layout Shop? How can I download any prize? The button “Get it Now!” does not work! Every year I get excited about your Black Friday Sale only to be remembered, that there isn’t something init for me. I’m already a life time member. I really would like to be considered or appreciated as a client who was from the beginning convinced of your company and that the Divi theme is one to stay and that won’t let me down – quiet contrary. My trust was more than fulfilled – you’ve excited it constantly. But this year, I really would like to get the layout of your Black Friday Sale – it’s awesome. Is that something you’ll make available soon? Not to sound rude, but that’s exactly what they’ve provided and announced quite clearly for existing members. Read the entire post and you’ll see where they inform existing members they can download the Black Friday layouts. No problem. I’m wasn’t talking about these layouts. I’ve downloaded them previous to my comment 😉 I’m talking about the layout used for this Black Friday 2018 campaign. Love the bold colors and structure. The real prize is Divi and the layouts. I’ve learned that the plugins can be more of a trap than a prize. Once you’ve used those plugins, you’ll probably have to renew them annually. That’s a pain. If you’re new to Divi, I would try to minimize the Plugins used. Divi alone is good value. Good tip, Chris. Great prizes, but eventually, you’re going to need to renew them, which means additional (recurring) costs. Lifetime member here – it’s too bad we have to download and import the layouts each time we want to use them. Is there any way they can simply be added to our Divi libraries, similar to other layouts? That I fully agree with. Why they have to be exclusive for the black friday period is beyond me. I’m a lifetime member. However, unless I’m missing something… so far all I can download are the six layouts. Where do I go as a LIFETIME member to get the same things those who join today or upgrade are getting? Thanks. The only thing a lifetime member gets besides the six layouts is a chance to win that extra expensive computer. I would rather have a choice of some cool plugins. I am not so sure we are ever going to see that. I would like to see next year a bunch of smaller contest prizes that would be a bunch of DIVI related plugins. what about iMac Pro? the page on which you can take part in the lottery redirects to another one, on which there is no information about it. I was excited to see the layouts until I realized they are the typical layouts. I would love to have those beautiful splash images that you use a backgrounds to showcase each one. Are those great splash images available somewhere? It’s quite disappointing, that loyal divi users only get a handful of themes and not a chance to get something new users are getting. I am new to the DIVI membership. I purchased the lifetime option within minutes of the start of Black Friday sale. I received my receipt and the welcome email. I have my login, but where do I find access to the Layouts Cloud. I think that was offered for the first 200 purchases. My receipt email is dated/timed at: Fri, Nov 23, 1:22 AM (3 days ago). Hello, I have the same issue as you. Purchased a new membership within the first 200 purchases, but they now offered me something else as my free gift and not Layouts Cloud that was advertised! I have already complained that this is misleading advertising! I hope this gets published for everyone to be aware! How do I get Black Friday offer.200 customers only get this offer ?. I was one of the first 200 people to sign up as a new customer on Black Friday and was told I would get an email about the prizes to be released today – Tuesday 11/27 – I have not received anything. Thanks! I upgraded to lifetime membership on Black Friday, and opted to get Pixie bundle as prize. I haven’t received download link yet (checked all email folders). What am I missing?